In recent past, there was a promotion running on Amazon and the Kindle version of this book was available for less than Rs. 50! We went ahead and bought it. By the way, if you want to get notified for many such interesting book deals, you can follow us on various social networks. We do share such deals with all our readers when come to our notice, regularly. This is how we got this book and read it completely. From our team, I will be sharing my views and reviews for this entire book in this article. Let us start take a look at the cover of the book. I’ve already shared my views about the cover of the book in the free content review article. Overall a fantastically designed cover page no doubt. The colors are cheerful and creates a long lasting impact of the book. Even the back cover is equally good. The cover designing team requires appreciation for the same. While I don’t want to reveal the key points of the book in way that it can spoil your reading experience, you can understand that some of them are unavoidable. Vidhaan, a young boy living in a small village with his mother is very enthusiastic about the future. Like every other growing up teenager he was also dreaming about doing something big and living a lavish life in future. He was accompanied by his cousin Sattu who is not only his sidekick and plays the role of a Vidushak (found in ancient Sanskrit plays) to give comic relief, but loves him from the deepest heart. They have a dog accompanying them. Viddhan was fortunate to get trained by a Guru who is living in a hut outside the village. The mysterious guru came to their village a few years ago, and not much is known about him. Viddhan was promised by the Guru, that on his convocation day, he (Vidhaan) will be told everything about him (the Guru). But, who could have understand the mystery of the future? Before Vidhaan reach to his Guru’s hut on that important day, the Guru was attacked. Furious Vidhaan tried everything he can and fought the attackers bravely by killing almost every one of them, leaving just one of them alive. But, he couldn’t save his guru. He was later approached by a team of horsemen lead by a warrior commandant revealing his guru’s identity as “Kaan”, one of the most respected warriors of their time! They convince Vidhaan to come with them to Arthala where the skills taught to Vidhaan are required the most. He was the only one who was taught the Bhumi Siddhi, an art, a warrior skill, known to Kaan only. Vidhaan accompanied by Sattu and his dog, leaves for the future and before going to Arthala, they had to visit the other kingdom. And in Arthala also, while he was expected and respected, the thing wasn’t easy for him. He require a lot of training and they are running against the time. It seems quite impossible to learn the art and skills in such a short period of time, while he is not actually aware of Bhumi Siddhi and all its aspects. He was only on the learning curve, and it is expected from him to be master of the same, like his Guru, Kaan. Will Vidhaan, be able to learn the things? Why he is required at Arthala? What is Arthala and why it is named so? What Devas, Asuras and other tribes are doing at the time? What leads to the battles between various kingdoms and will Vidhaan be able to survive at all? Well, to get answers to all these questions you need to read the book, and you will enjoy reading it for sure. I can say that it is really interesting despite some bumps are there. While the book tries to cover many things and you may not find some tracks quite interesting, but overall, everything has a reason and ultimately the things will fall in place, so you shouldn’t skip anything. While it is the mythological tale, it is a complete creation of fantasy and author make it very clear. The characters are found developed gradually and they keep growing as the story moves ahead. That makes them more realistic. Even the characters with super-heroic strengths are not complete. They have their limitations or short comings. And, as we tend to see black and white characters in fictional work, we, by heart know that if you try to analyse someone neutrally, then you will find the person having shades of grey. Nothing is absolute black or white. A man is the result of things happened to him and done by him. The author visualizes the character in this way, and explore them accordingly. And, that goes fine with the book. My grandfather told me that some authors are good at telling stories, but have limited imaginations. At the same time, some of them are great at imagining things, but may not be good at exploring them on the paper. Vivek Kumar, seems to be good at both the attributes. 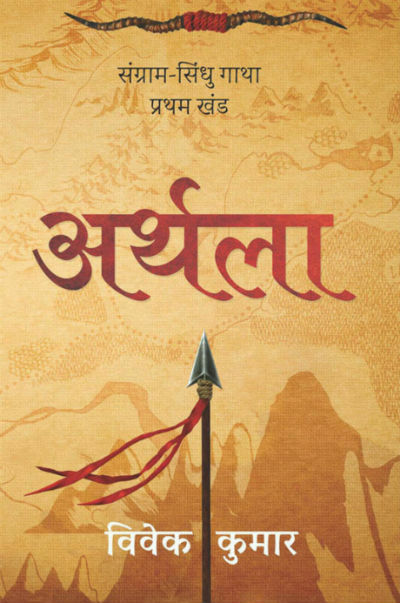 This is his first book but he delivers something which even some bestseller authors don’t. The author seems to be a nature lover and he is good at exploring natural beauties, monuments, places and other stages. You will like the way the surroundings and explored. At the same time, the author explores the emotional stuff and war scenes with equal brilliance. If the book was written in English, definitely its reach will be wider and more and more readers can be acquainted with it. Some of the scenes from the book are really impactful, but I cannot talk much about them to avoid spoilers. Let me share some of the lines from the book which I found really interesting. So, there is philosophy, there is reality and there are literary attributes all available in the book. The book has some war scenes and other stuff, but, there is nothing which can be limited to the adult readers. It is one of the good attributes of the book. A child can read this book as fantasy fiction and and adventure lover can explore it in his own perspective. The author seems to be an avid reader and has a good control on the language. His imaginations and writing both reflects the same. The way, the author explores the psyche of each character is something worth appreciation. The author is confident about the story he wants to tell. It seems that the entire story is there in his mind and he expects at least four brooks in the series. I am curiously awaiting for the next book in the series. And the way in which this book ends with fantastic action scenes, you will also be waiting for the same for sure. A really nice book with fresh and imaginative writing. The book has some bumps, but overall it is definitely a good read. Some of the dots are not connected yet, but as there are more books to come in the series, we can wait for them. In my opinion, you will enjoy the book if you love to read fiction mixed with mythology.